Earlier this month I attended and recorded the proceedings of the Israel Palestine International Law Symposium, held in Winnipeg September 7 – 9. While I thought I was better informed than the average Canadian going into the symposium, by the time it was over I was overwhelmed by the amount of new information I received. Suha Jarrar is a Palestinian human rights researcher and advocate, and currently the Environmental and Gender Policy Researcher at Al-Haq human rights organization in Ramallah, Palestine. More. Dimitri Lascaris is a Canadian lawyer, journalist and activist and a board member of Canadians for Justice and Peace in the Middle East. More. Michael Lynk is Associate Professor of Law at the University of Western Ontario and United Nations Special Rapporteur on the situation of human rights in the Palestinian Territory. More. David Matas is an international human rights, refugee and immigration lawyer and Senior Honorary Counsel for B’Nai Brith Canada. More. 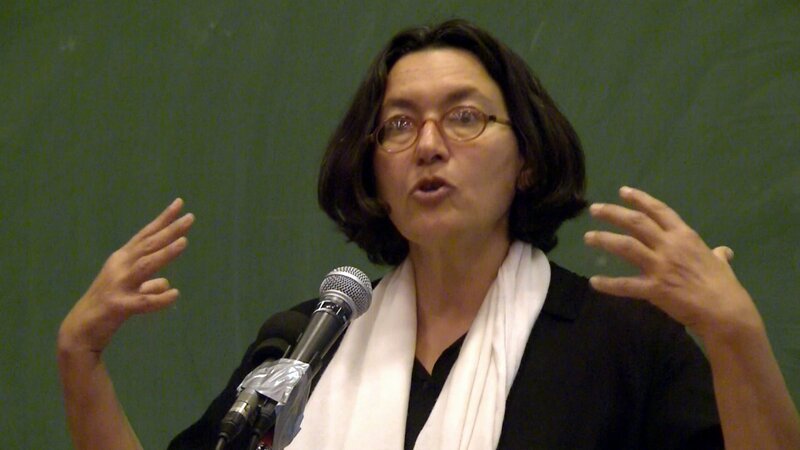 Virginia Tilley is Professor of Political Science at Southern Illinois University and co-author of Israeli Practices towards the Palestinian People and the Question of Apartheid. More. For me, the main takeaway of the symposium is that by supporting the illegal activities of the State of Israel, our own federal government is in violation of Canadian and international law. If you disagree with this assessment, or want to understand why I believe this to be the case, watch these videos. Introduction: In this clip, symposium coordinator David Kattenburg explains the origins and purpose of the symposium. Keynote: In this clip, Michael Lynk explains how international law has largely been ignored or broken by Israel over the past several decades of its occupation of the Palestinian Territory. One State or Two? In this clip, we hear from Michael Lynk and Virginia Tilley. Human rights: Rhetoric vs Reality: In this clip, symposium Dimitri Lascaris describes the failure of western governments to uphold the human rights of Palestinians. Palestinian Rights & Obligations: In this clip, we hear from Suha Jarrar and Jonathan Kuttab. Palestinian Rights to Resources: In this clip, Suha Jarrar outlines how Israel has misappropriated key Palestinian resources. Israeli Rights and Obligations: In this clip, we hear from Michael Lynk and Dimitri Lascaris, who look at different aspects of Israeli’s legal rights and obligations in the Occupied Palestinian Territory. Is Israel and Apartheid State? In this clip, Virginia Tilley argues that Israel is an apartheid state. Canada’s Rights and Obligations: In this clip, Dimitri Lascaris discusses relevant aspects of Canadian and international law. Concluding Remarks: In this clip we hear concluding remarks from David Kattenburg, Mark Golden and Dean Peachey. 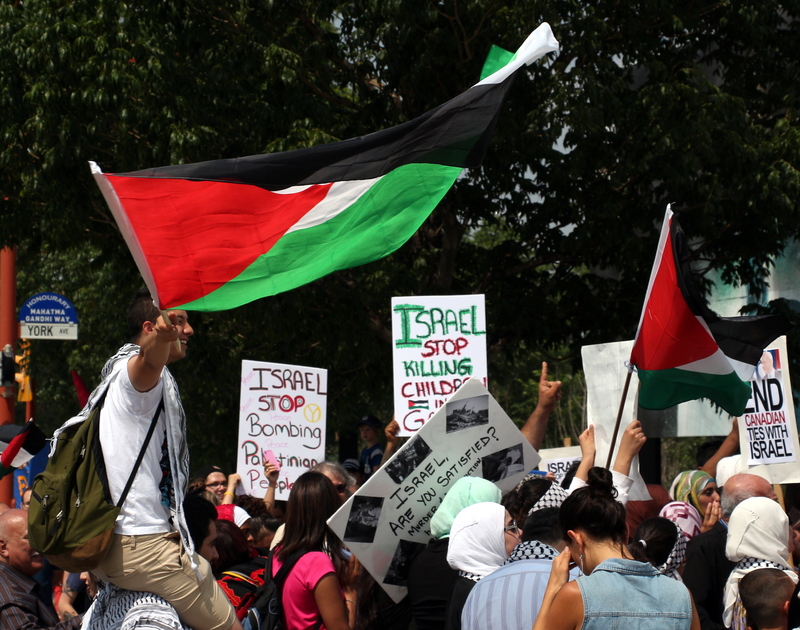 Video: Can boycott, divestment and sanctions stop Israeli apartheid? Respect, protect and promote the rights of Palestinian refugees to return to their homes and properties as stipulated in UN Resolution 194. The BDS campaign has been taken up by human rights activists around the world and there is some evidence that it is having an impact. For example, last month the Norwegian retail chain, VITA, announced it would stop all sales of products originating from settlements in occupied Palestine, including Ahava cosmetics. Also, last month, graduate students at Carleton University overwhelmingly voted in a referendum to call upon the university’s pension fund to divest from four companies that are complicit in the occupation of Palestine. The BDS campaign is being credited with the decision of the West London Waste Authority to exclude French multinational Veolia from a £485 million contract. Veolia helped build and is involved in operating a tram-line which links Jerusalem with illegal Israeli settlements in the Palestinian West Bank; it also takes waste from Israel and illegal Israeli Settlements and dumps this on Palestinian land at the Tovlan landfill. 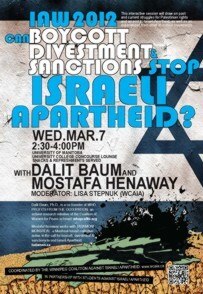 “Can boycott, divestment and sanctions stop Israeli apartheid?” was the title of a forum held March 7, 2012 as part of Israeli Apartheid Week 2012 in Winnipeg. Featured speakers were Dalit Baum and Mostafa Henaway. Baum is an Israeli activist and co-founder of WhoProfits.org, a website that exposes corporate complicity in Israel’s subjugation of Palestinians. Henaway is a human rights activist who works with Tadamon! Montreal. Moderated by Lisa Stepnuk, the forum was sponsored by Students Against Israeli Apartheid and the Winnipeg Coalition Against Israeli Apartheid. As usual, I was there for Winnipeg Community TV to record the discussion. As a part of Israeli Apartheid Week 2012 in Winnipeg, Paul Burrows and Cheryl-Anne Carr discussed the impact of colonialism on the indigenous peoples of Canada and Palestine. The similarities are disturbing and striking. Hass was at the University of Winnipeg Sept. 30, to provide a unique perspective on the Palestinian struggle, that of an Israeli Jew, a woman and a journalist for Haaretz, who has lived and worked in either Gaza or the West Bank for the past 17 years. Hass was forceful in her denunciation of the conditions under which Palestinians live and uncompromising about the need to end the occupation and restore the rights of Palestinians in Israel and the occupied territories. What especially caught my attention, however, was her diplomatic yet unmistakable suggestion that activists outside of Israel take stock of their own societies and refrain from applying a double standard toward Israel. Hass returned briefly to this theme late in her presentation. While she expressed profound regret that she and other Israeli activists had not succeeded in convincing fellow citizens to end the suppression of Palestinians, she advised activists to get a sense of proportion. 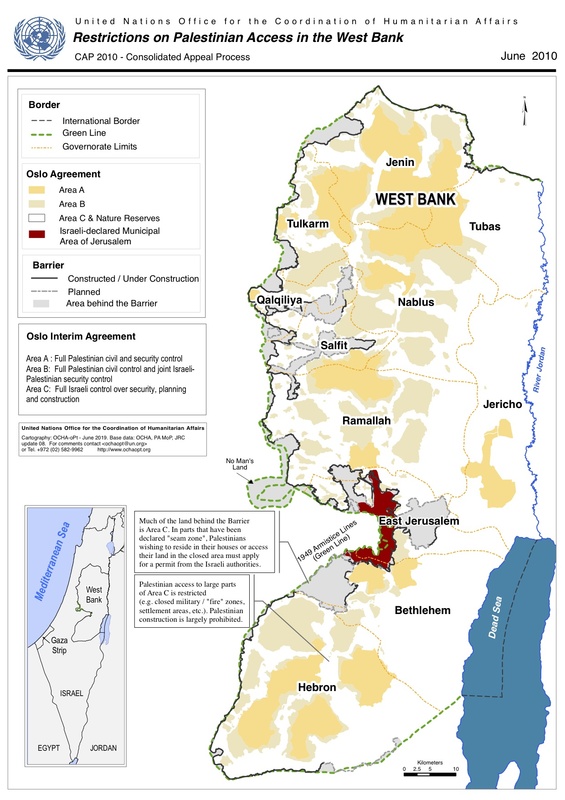 If you look at the map Hass used in her presentation (click for a larger view) it would seem that the Israelis have borrowed the Canadian playbook – force the aboriginal peoples onto isolated parcels of land, compel them to live in poverty and control every aspect of their existence until they lose the will to resist. The main difference in this regard is that we’ve been doing this to “our” native peoples for a much longer time. My take-away from Amira Hass’s presentation: stand up for Palestinian rights, but remember your responsibility for stand up for aboriginal rights in Canada. Please share this video widely, especially with those who have imbibed deeply at the well of Israeli propaganda. For them, it could be an eye-opener.